Didnt post my usual Sunday night stuff last night as I stayed at my Dads house, First time I've missed it in a VERY long time! But I didnt have the internet or acess to a camera, so I took a weeks leave! It was also the anniversary of my best friends death this weekend so I spent alot of time with friends rather than on here. Spent today writing lists of things I need to do this week as I'm so behind once again. I always plan things for the week ahead on a Monday, but Being ill last week really took it out of me, I lost 7lbs purely because all I did was sleep and lie in bed. However I've done my best today to undo that, I had TWO, yes two panninis for lunch. I ran a few errands today in town, picked up a package ton of new styles for my jewellery line, which shall be making it way online soon and did some university work. Our current project is based on commitments, I cant decide what to do mine on yet. I was going to base it around my blog but I cant work out how I'd translate that into imagery. Tempted to do it on wrestling, but who knows. Le sigh! Today's outfit is just as generic and typical of me at the moment. 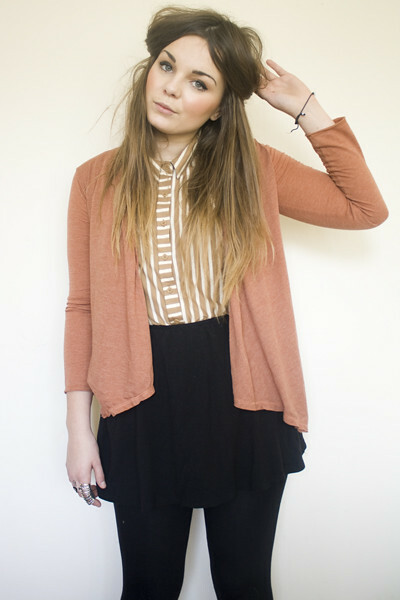 Warm colours, high waisted skirt, cardigan and default hair style. One of my main criticisms here on the blog is that I always wear the same things, I'm just one of those people who finds a style they like and sticks to it really! Less effort as well as everything goes together! Pretty much all things I'm wearing today have been worn before on the blog. I'm tempted to do one of those 30 for 30 challenges like Jen did. However I really wouldn't know what to choose for those 30 days! Might give it a bit more thought and maybe do it! Could actually be a good thing to do as a commitment for my project! absolutely in love withe the cardigan! they're all beautiful colours. i'm a big fan. I love the top, it's such a gorgeous colour, great for the summer. Love the warm colours you have used! Experimenting with styles may be fun but sticking to the same style is great because it shows you that you really do have a certain personal style, so no need to worry! Planning out your week is a good move! You know what you need to do and when. Also, I'm planning on buying some of your rings and the blue tooth necklace on your shop, but I wanted to make a suggestion. Some of your rings are adjustable, but there aren't any photos to show what the adjustable bit looks like. Maybe you could include a photo of the back of one of the rings if there's 6 different styles so people can judge whether it will stay well on their fingers and so on. It would help me come to a better decision as to which ones I will get. And have you always had the lookbook colours on your outfit posts? I love it! so cutes as always. xo. I love the colours of the shirt and cardigan together! lovely outfit! love the colours and i want that shirt everytime you wear it! Definitely do the 30 for 30! It's HARD but really helps you 'understand' your wardrobe, as douchey as that sounds. I love your hair. The outfit is wonderful, especially the blouse. I don't think that should be a criticism at all. If anything, you have your own style that you know works. Jeezz! Love the colours here, and I hope you had a nice week away from the blog. Gorgeous outfit lily! 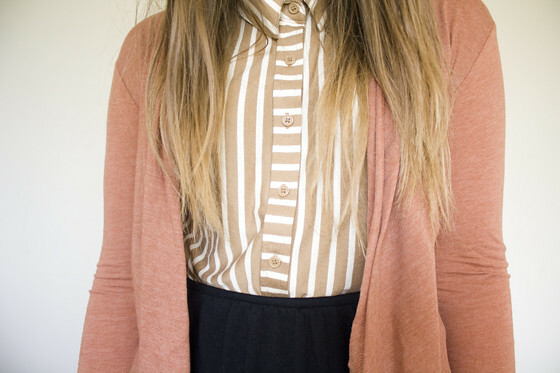 I love the warm colours, and the topshop shirt is to die for! i like the colors ! glad you're feeling better Lily. Also, can't wait for payday so I can spend some mahonies in your shop, hello rings. I'm actually wearing kind of the same thing everyday, too, but since I started blogging I try to wear different outfits more often. It kind of inspires me to test out my borders and makes me more creative. Pretty, pretty! your hair always looks perfect! Your style is impeccable and darling, if you feel great in the way you dress, you should stick with it! The color palette of the outfit is gorgeous, and I'm always a sucker for high waist skirts. Glad you are feeling better, dear! I love this look, that shirt is adorable! You stick to what you know and that's what's so great, you do you and you do it well!!! I'm sure that's why so many people look & comment on your blog! I love your jewlery store and blog! I was wondering though, do you design the jewlery and then it gets shipped to you to be sold? I've been wanting to open one like yours, but I have no idea how! Thanks! such a cute top! i've had my eye on it for a while now. might have to invest. As basic as the outfit may seem, it looks so classy as well as comfortable. I love neutral/warm/earth tones, so it's just perfect to me! So sad to hear about the anniversary :( Hope it wasn't too sad or stressful of a time. I'm glad you feel better, and I can't believe you lost that much weight. Go eat girl! I dig your style is actually pretty unique. I really love your clothes. I wish you gave everything to me haha. Love the color of your cardi! So pretty! Love this outfit, especially the coral colours. I always feel like I wear the same things over and over, but unfortunately being a student limits my clothes allowance! Glad you're feeling better! Now you have to make up for all the food you missed out on by eating tonnes of chocolate. purchased another ring- yeahy for me :) and did a little link from my blog to your shop hope this is okays dear. Love the colours here, and love the palettes at the bottom. Aaand I've only just realised you have your lip pierced - cool! Not sure if you've ever done one, but would be v interested in a tutorial on how you clip your hair up like that as I really rather like it. we absoloutly love your buttoned up striped shirt and the thoughtful colour pallete beneath your photos. thats a thumbs up from us !